Expectations and the unexpected are like two sides of a coin. You never know where your fortune lies until the coin flips bringing joy or sorrow. Yet who can be sure if it is tragedy in disguise of jubilation or vice versa. Such is the unpredictable nature of life. Tension was mounting backstage and the drama teacher was at his wits end with only a few minutes till curtain raise. No matter what the show will go on. There was no way out of the dilemma except to reverse the roles. The King's role was handed over to the lad originally cast for the servant's role and Sirimal, who had been adamant on portraying the King, was dismayed to find himself forced with the role of the servant. Gone were the glorious dreams of conquering the stage.... Or was it so? Remember. Life has a strange way of delivering the unexpected. Award winning filmmaker, Somaratne Dissanayake's latest movie Siri Raja Siri alias Kiri Ibbandeniye Maharajathuma is making a successful run in theatres islandwide. 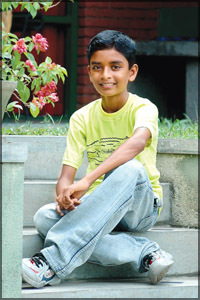 The movie introduces another talented child star, Kokila Pawan Jayasuriya, to the big screen. Kokila, 12, is a Grade Seven student of Piliyandala Madya Maha Vidyalaya. He is the eldest in a family of three and the son of Dhammika Dinesh Jayasuriya and Deepika Jayasuriya. Kokila has a brother, Dilshan Sathsara and a sister Hiruni. Though his role as Sirimal brought him into the limelight on a much broader scale, Kokila was one of the few exceptionally gifted children who took his first step to acting through stage dramas. "I approached the stage through Sri Shobitha Dhampasela and school. Our drama teacher, Kokilani recognised my skills and encouraged me to take part in the children's programme Hapan Padura. I applied, got through the interview and am a member of the team. I was elected for the role of "Sethu" in Jayalath Manoratne uncle's stage drama Thala Mala Pipila and later another of his dramas called Makara. I took part in Bandula Kuruwitarachchi's stage drama Punchi Punchi Petiyo which won first place in the State Drama Festival in 2005. I portrayed the role of a busy bee," Kokila said. It was not long before many took note of this bright young lad and sought to enrol him for a part in their creations. He was chosen to portray Aba's childhood in Jackson Anthony's much hyped about epic movie Aba and was singled out among many to take up the lead role in Siri Raja Siri. "We had to go through interviews and take part in workshops. None of us got to know that we were chosen till the end. Around 40 children took part in the production," he recalled. Unfortunately both the movies that he was set to take part were scheduled to start shooting in August. There was no way to budge the dates. Kokila was faced with a choice which he was reluctant to take, a choice between Aba or Siri Raja Siri. "It was a tough choice. I was looking forward to working under Jackson uncle, Somaratne uncle and Renuka aunty. Jackson uncle advised me to drop Aba since Siri Raja Siri offered the much bigger role," Kokila said adding that he had even grown long locks to portray Prince Aba. And is Kokila satisfied with the choice he made towards the end? "Yes, I believe a lot of people have taken the movie to their heart. I get a lot of fan mail and phone calls," he replied. We also heard that your friends have started to call you Kiri Ibba. Is it true? (Laughing) "Yes, that's true but once they see it written on paper, they will deny it. Apart from my schoolmates a lot of people who have watched the film had started to call me with that nickname. I have realised that they do so because they are fond of me." Tell us what it was like acting in the movie? Are there any special memories? "I was not an expert swimmer like Sirimal when I took up the role. Somaratne uncle and Renuka aunty trained me and I learnt to swim well in a short period. Now, the Kokila you see today can swim well just like Sirimal. Shehan, Sharanya and Malith supported me a lot when we did scenes together. I don't think I could have done them successfully without their help." Let's imagine Kokila in Sirimal's shoes. If you were requested to do another's role while your role was given to someone else would you agree to do it? "I believe I would because there isn't sufficient time to take other measures. It is an unexpected turn of events and we will have to take procedures whether we like it or not or else a lot of people will be disappointed," he said without hesitation. Kokila's goal is to continue his studies while engaging in acting. He expressed his thanks to his family, his school drama teacher, Jagath Beneragama, Jackson Anthony, Jayalath Manoratne, Somaratne Dissanayake, Renuka Balasooriya and all those who helped him in his path to success. "I would like to wish all the readers a very prosperous new year and invite all of them to enjoy our movie," he concluded with a wide smile. Hang into your seatbelts. You are in for the ride of your lifetime! The Director duo Abbas-Mustan are back with yet another thriller movie titled ‘Race’. It is the story of two brothers - Ranvir Singh (Saif Ali Khan) and Rajeev Singh (Akshaye Khanna). They breed horses on their huge ranch houses and are one of the biggest bookies in the horse racing circuit. The elder brother Ranvir is known to be very smart and aggressive while Rajeev is a constant alcoholic. Sophia (Katrina Kaif) is Ranvir’s personal secretary and loves him. Ranvir is however ignorant of her feelings towards him. Shaina (Bipasha Basu) is an Indian Model and shares a beautiful relationship with Ranvir but fate has other plans in store for her. She gets married to Rajeev and her world is shattered when she discovers that he is a chronic alcoholic. Rajeev is still addicted to alcohol although he promised his elder brother that he would leave it after marriage. In a moment of truth Ranvir and Shaina draw close to each other and an affair begins. All hell is broken loose when Rajeev suspects his wife of double crossing. A Murder is committed. Enter Robert.D. Costa(Anil Kapoor), a detective who lives by his values. He is desperate to find out the truth and arrest the perpetrator. He is very clever and has a bizarre addiction to fruits. Mini (Sameera Reddy) is R.D’s personal assistant. Thus the Race begins as the story unfolds in a series of unexpected twists and turns and a nail-biting climax which is sure to keep you on the edge of your seat. ‘Race’ is screening at Liberty Cinema and is distributed by E.A.P Films. ‘Race’ has raced ahead and has turned to be the biggest blockbuster of Bollywood this year. Says a noted trade analyst, “Race has done fabulous business and is expected to garner huge returns for its distributors.” He also points out that one actor to have gained exceptionally from the film is Saif. While SRK is famously called the King Khan (King of Bollywood), one actor who can aptly be called Prince Khan (Prince of Bollywood) is Saif Ali Khan. He has now embedded his royal stamp in Bollywood. Among those who visited the Chinese Film Festival, a majority of them would have realised how sophisticated, grandeur, colossal, remarkably expressive the contemporary Chinese Cinema is. Thematically the variegated human relationships are exploitative and subtly depicted through the lenses of state of the art cameras. The vastness of mainland China is brought to us by taking us literary to even remote places through arduous journeys. On earlier occasions I wrote my impressions on some of the recent films from China that I saw in Goa and Thiruvananthapuram. Except ‘Call for Love’, which I missed seeing, I was enthralled with the rest of the films screened at the Festival. They were: ‘When Nuoma was Seventeen’, ‘A Railway in the Clouds’, ‘Prince of the Himalayas’, and ‘Honeymoon’. ‘Nuoma’ and ‘Honeymoon’ fascinated me for two reasons: “x-raying” the minds and behaviour of two teenagers and the subtlety with which love and understanding could exist among people is the themes which are brought out in these two moves. One may say that I am sentimental, but I love “Love”. I must confess that I am romantic in many ways. Be that as it may. The other two films astonished me because of the difficulties in filming in a vast canvas. One was about the culmination of a 50 year adventure in constructing a railway between China and Tibet and the other was a free interplay of the theme of ‘Hamlet’presented in a different and possible understanding to befit the Chinese royal court drama. These films also give evidence to my understanding of contemporary cinema. The borderline between ‘arty’ and ‘commercial’ cinema is hardly noticeable. I strongly feel that if the commercial circuits of exhibitors prefer blockbusters and thrust them to entertain the masses who may not be informed or cultivate tastes, the National Film Corporation can import quality films and show them to cinemagoers so that the viewers are better educated in appreciating aesthetic aspects of cinema. While we are on the subject of the Chinese Cinema let me note the name of an important Chinese filmmaker: Zhang Yimou. His film ‘Curse of the Golden Flower’ was shown at the Kerala International Film Festival last year. Although I attended the festival I missed seeing it because I had to make a choice between this film and another. 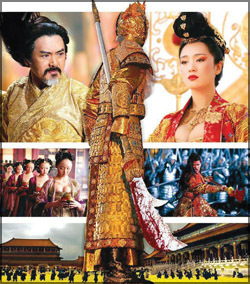 One other reason was that the Chinese film was a historical one depicting the 10th century Chinese royalty and I did not take a fancy to that aspect but I was informed that the film was good. He had also added that he had made his first feature film when he was 37 and therefore he had no time to duplicate. The director is part of China’s Fifth generation of filmmakers, who began making films after the Cultural Revolution. Others from this group include Chen Kaige and Zhang Junzhao. He attended the Beijing Film Academy. One other information: He would be the Chief Director of opening and closing ceremonies of the 2008 Olympic Games in Beijing.